It has been a busy month since our last newsletter. We are really able to see that God is working and are excited about the future of ministry in Japan. Thank you for praying! As the Christmas season approaches we will have a very hectic month, with many special events surrounding this holiday which many in Japan "celebrate" but yet don't know of the true meaning. Specifically pray for an ASK Christmas party on December 16th and BFF's Christmas worship on December 24th. At these events many of our unchurched and seeking contacts will hear and understand why Jesus was born. Thank you for praying for the core members of BFF. We had a vision meeting last weekend and are praying that the Lord will make our little body of believers bold and excited about this church plant. Please pray that God continue to take the words that were shared in that meeting and the explanation of what CHURCH is, and use it to set a fire in the hearts of our members. That they would really begin to see how they can be involved in the work of BFF, and then that they would be bold to step out and join us in this work! We especially wanted the group to understand that the church isn't just contained in the building, but that we are to go OUT and be the church in our daily lives. Pray that they begin to live this out in their daily lives and become a living, walking part of the Body of Christ that will impact the world around them everyday! Speaking of buildings, we want to thank those of you who donated towards our building fund! It is fully paid for!!! Praise God!!! This is the center of ministry where lots of Bible studies take place, outreach happens, administrative work goes on constantly, the church worships at least once a month, and the Camps live. We are not calling it "the church" because we want to really drive home to our church plant members that church is not a building. To prevent this little group, most of whom have been members of traditional churches in Japan, from falling back into a routine of thinking that worship and ministry take place only in that building, we are not referring to the building as a church building. It is just the Aroma Ministries house. It is paid for and without it we couldn't be doing this work! Thank you all so much!!! That building and Rocky and Marla's home are central to BFF's work. It is SUCH a blessing!!! Please watch our video newsletter for details of all that is going on. And thank you so much to those who volunteered to send the things we need for the upcoming Christmas events. Most everything arrived this week and we can't wait to show you pictures of your gifts being used to emphasize the REASON for this wonderful Christmas season!!! Pray for the Aroma team as this will be a very busy month! We need health and stamina to get through it. But praise God we are looking forward to some time off and a wonderful retreat in the mountains near Fuji over the New Year holiday!!! From our little team to all of you Happy Thanksgiving and may Jesus pour out His love on you and your family this Christmas Season! We would love to hear from you. We can not tell you how much all you all mean to us! 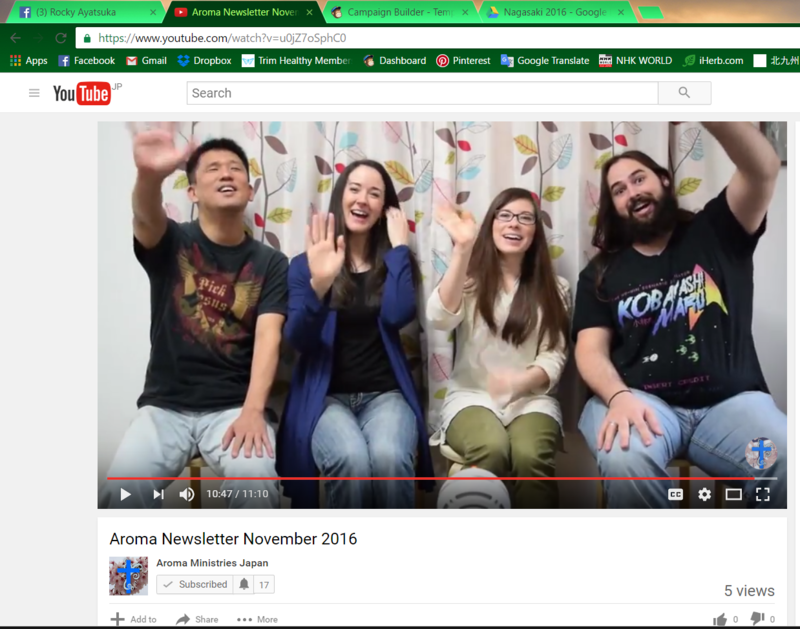 The team at Aroma Ministries wants to extend a hearty 'thanks y'all and arigato' to all of our wonderful supporters. 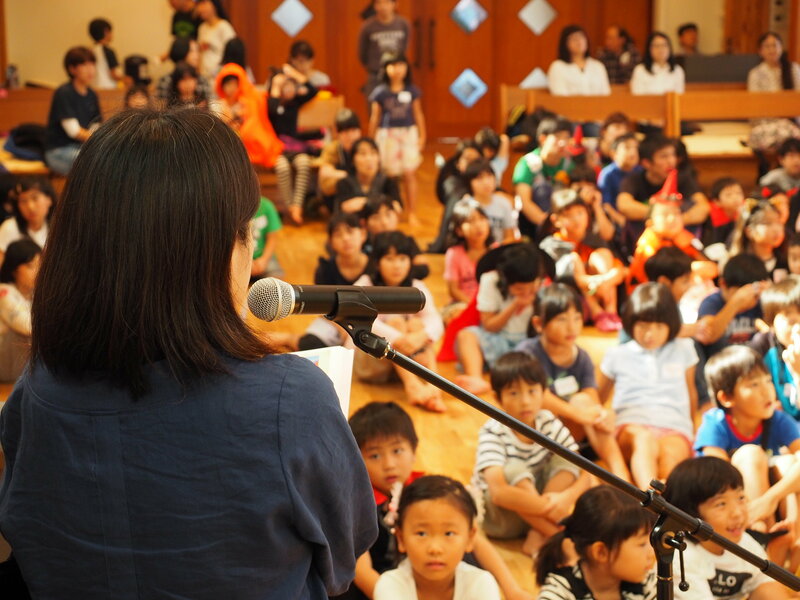 You help us shine the light of Christ in Japan! Many blessings on you and let us hear from you, please let us know how we can be praying for YOU too.